A bridge is used to replace one or two missing teeth, it uses the teeth on either side of a space to hold a replacement tooth in the gap. With this procedure you can possibly eliminate the need for a denture to give you the smile you have always dreamed of. The conventional way to do this is to use crowns on the adjacent teeth, and the procedure is the same as for making a crown. 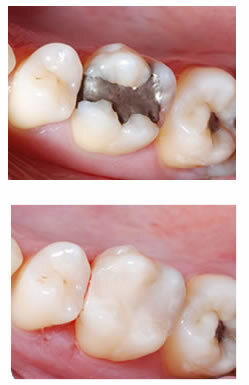 Adhesive bridges do not involve crowns and can work well in many situations. There is much less preparation to the adjacent teeth. A metal backing is bonded to the adjacent teeth with a replacement tooth in the gap.